Ceratozamia robusta is a medium-to-large-sized cycad native to Belize, Guatemala, and Mexico, growing in subtropical moist lowland forests. Please click here to see an enlarged photo of this species. 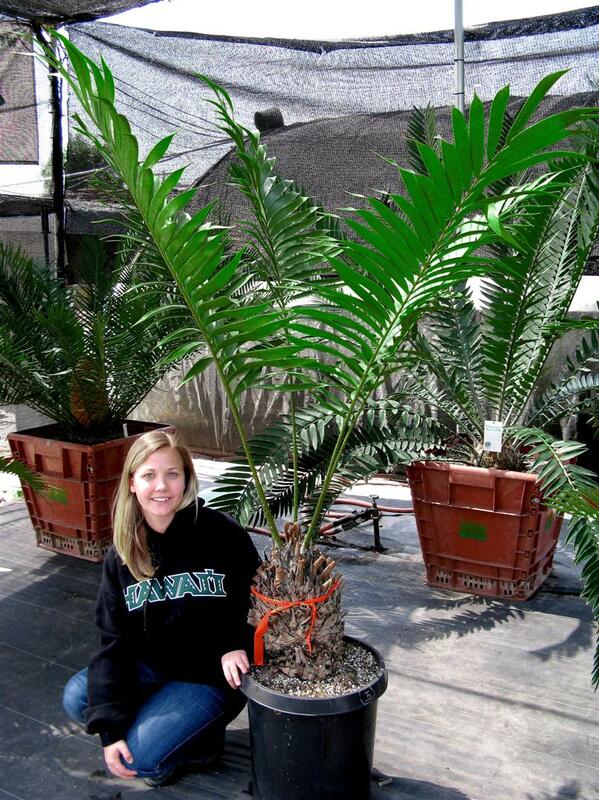 Ceratozamia robusta can develop a trunk of up to 6 feet tall and 1 foot in diameter over time. Its dark green smooth leaves project upward and outward from the trunk, spreading in a lovely dark leaf flush up to 8 feet tall. It does well in tropical and subtropical climates. It can handle temperatures to a few degrees below freezing. In areas that experience frost, plant Ceratozamia robusta in an area that gets overhead protection or radiated heat from a structure or wall. Ceratozamia robusta may stay solitary or form an impressive clump over time. Younger plants do well in large containers, but this plant achieves its full potential needs when planted in the ground Protect Ceratozamia robusta from dry, hot sun. Morning sun or filtered sun work best. Ceratozamia robusta prefers regular watering, mulch and fertilizer.